Cape May holds a special place in Danielle’s heart so it was no surprise that their wedding was at the beautiful Chalfonte Hotel, Cape May’s oldest hotel. We lucked out with the weather and ended up with a gorgeous fall day. The rain changed the ceremony plans but Jeffrey and Danielle just rolled with it and moved it to the porch of the Chalfonte Hotel.. 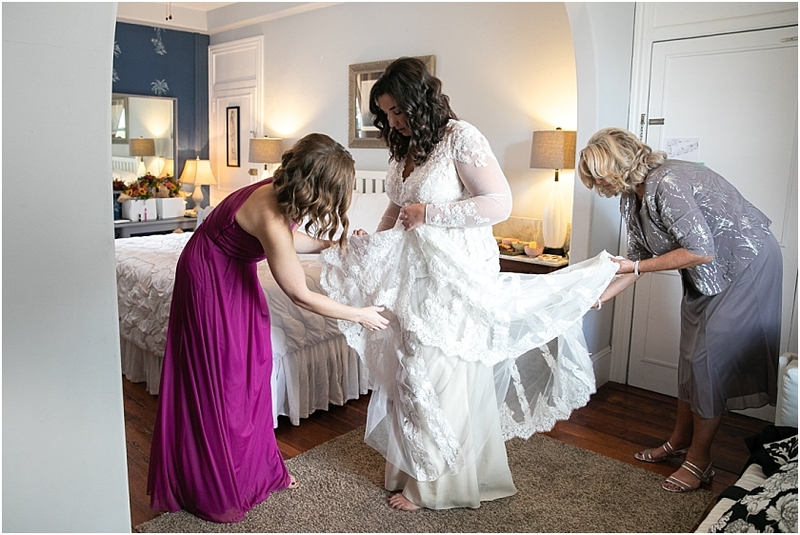 The wedding from start to finish was full of love and a lot of personal details and touches. For the first look we did it a bit different than normal. Jeffrey and Danielle held hands around a tree and then turned together to see one another. It was such a beautiful moment. I loved how they personalized it! During the ceremony their niece was the adorable flower girl and their pup served as the ring bearer (with a well tied on ring bag). Danielle’s godfather Tim officiated and gave a very emotional and heartfelt service. For the reception, Jeffrey’s sister Sylvia made the beautiful wedding cake. She’s not a professional baker but you’d never know it!